One activity of Dekra group, the European leader in inspection and certification in the construction, the industry, the environment and the transportation sectors, is to diagnose and assess the environmental situation of a site. It is within this framework that DEKRA Industrial implements geostatistics since 2012. National Technical Manager, Polluted Sites and Soils at Dekra Industrial France, Damien Faisan explained. Damien Faisan was already convinced of the relevance of geostatistics to answer its needs of rationality. He chose the software solution Kartotrak because, he said, it is an easy to learn and to use software which perfectly works together with the GIS used at Dekra Industrial France in their studies. – Map contamination in a more detailed and realistic way, geostatistics (and interpolation by kriging) allowing to take into account the spatial behavior of the pollutant(s). 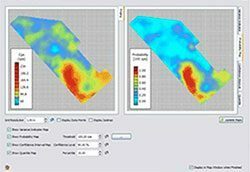 – Display the contamination models and surveys in the same 2D or 3D view. Kartotrak delivers maps which immediately allow identifying the most polluted zones or the much less sampled. 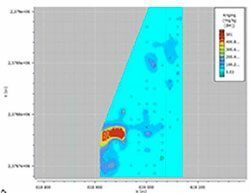 Because the calculated polluted volumes are systematically associated with a level of uncertainty, Kartotrak enables to assess the margin of error associated to the remediation budget and to secure it. 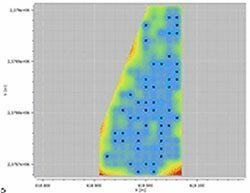 Kartotrak allows Dekra Industrial to provide their clients with probability maps of occurrence of a given level of pollution. Thus, decisions are fully informed. With geostatistics, results obtained are based on opposable scientific basis, which makes possible any counter-expertise. « 2D and 3D maps are an unequalled communication tool. Our clients are able to visualize future work at first glance!” Damien Faisan concludes. At Dekra Industrial, Kartotrak is today used for projects with high stakes and for which the need to secure prescriptions is essential. Nevertheless, the methodology related to site studies is in constant evolution, this means that the use of geostatistics in the projects will tend to expend.